Christmas is known as the "feast of light", as Jesus, the Light of the World, the Rising Dawn, the Light to be revealed to the Nations (Luke 2, 32), is born. Includes explanation of the use of lights or candles in different customs of nations, including the Irish custom of candles in windows, the Yule Log, and the Christ Candle. Those of the Jewish faith annually celebrate in December the anniversary of the Re-dedication of the Temple as a "feast of lights" (Hanukkah). Christians have made the Nativity their feast of lights in honor of Him who was born as a Light to illuminate the nations (Luke 2, 32). In medieval times it was customary to represent Christ the Lord by a burning candle. This custom is still preserved in the liturgy of the Church, as for instance, the Easter candle, the last candle at the Tenebrae services of Holy Week. 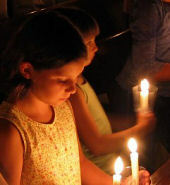 At Christmas, a large candle symbolizing the Lord used to be set up in the homes of the faithful on the eve of the Feast. It was placed in the center of a laurel wreath and kept burning through the Holy Night, and was lit, thereafter, every night during the holy season. The custom of the Christmas candle is still kept in its original form in some countries. In Ireland, the mother or the father of the household lights a holly-bedecked large candle on Christmas eve while the entire family prays for all its dear ones, both living and departed. Among the Slavic nations (Poles, Ukrainians, Russians) the large Christmas candle is put on the table after it has been blessed by the priest in church. The Ukrainians do not use candlesticks but stick the candle in a loaf of bread. The customs of placing lighted candles in the windows at Christmas was brought to America by the Irish. The historical background of this custom is interesting. When religion was suppressed through Ireland during the English persecution, the people had no churches. Priests hid in forests and caves and secretly visited the farms and homes to say Mass there during the night. It was the dearest wish of every Irish family that at least once in their lifetimes a priest would arrive at Christmas to celebrate the Divine sacrifice during Holy Night. For this grace they hoped and prayed all through the year. When Christmas came, they left their doors unlocked and placed burning candles in the windows so that any priest who happened to be in the vicinity could be welcomed and guided to their home through the dark night. Silently he entered through the unlatched door and was received by the devout with fervent prayers of gratitude and tears of happiness that their home was to become a church during Holy Night. To justify this practice in the eyes of the English soldiers, the Irish people used to explain: "We burn the candles and keep the doors unlocked, that Mary and Joseph, looking for a place to stay, will find their way to our home and be welcomed with open doors and open hearts." The English authorities, finding this Irish "superstition" harmless, did not bother to suppress it. The candles in the windows have always remained a cherished practice of the Irish, although many of them have long since forgotten the earlier significance. The custom was brought to this country in the early nineteenth century and spread throughout the land, so much so that in recent years electric candles and lights of all kinds are used in homes and in public squares during the Christmas season. Business districts as well as suburban streets spend much time and money to make their decorations gay and bright with lights. An inspiring and colorful sight are the Christmas fires burned on the peaks of the Alps in Central Europe. Like flaming stars they hang in the dark heavens during Holy Night, burning brightly and silently, as the farmers from around the mountain-sides walk through the winter night down into the valley for midnight Mass. Each person carries a lantern, swinging it to and fro; the night seems alive with hundreds of glow-worms converging toward the great light at the foot of the mountain — the parish church — shining and sparkling, a "Feast of Lights," indeed. No one who has witnessed this scene on Christmas Eve in Austria, Bavaria, or Switzerland will ever forget it. A seasonable Christmas in England and Northern Europe is a cold one. In past centuries it was even colder than it is now because the "old Christmas" — before Pope Gregory XIII corrected the Julian calendar in the sixteenth century — came eleven days later, on January fifth of the present calendar. The Christmas Log to the firing. . . . In some places the Yule log was the whole trunk of a tree, carefully selected on the preceding feast of Candlemas and stored away to dry out during the summer. Many popular customs and ceremonies were connected with the Christmas log. The unburnt parts, for instance, were put aside and preserved because the new log of next year had to be kindled with wood from the old one. The main purpose of the log, however, was to blaze and burn on the open hearth during Holy Night and on Christmas day. In spite of modern heating today the Yule log has survived in many homes in England and America as an old and cherished Christmas tradition, though actually it originated among the Germanic tribes as a pagan celebration for the Yule-god Thor at the time of the solstice.